stay tuned for the outcome, comments are closed, thanks to everyone that entered. When last I rambled about what quilt I would be offering in this giveaway, I think I left off at Plan D.
I’ve decided to go with Plan E. A quilt that is already quilted and finished. This quilt was originally purchased by my Grandmother. It was one of those “hand-quilted” things that was pretty badly hand quilted. She let me have it, I took it apart, and then requilted it with a new backing. I can’t remember the exact dimensions, but I think it fits a FULL size bed. For a number of reasons, she does not need it any longer. 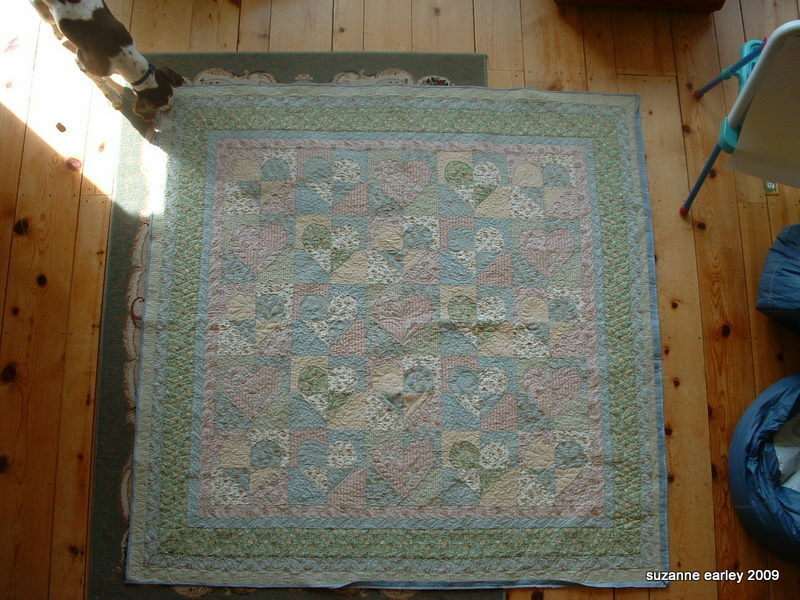 In fact, it’s been quilted since April 2006, sitting in a pile waiting to for the binding to be finished every since. So it’s not like I’m taking quilts off of people who are going to be cold. It doesn’t really suit the style of my husband or children, though they don’t seem to scruple too much over which quilt they DO grab. If you commented on the Housewarming Party post, you are already entered. If you haven’t entered, you can comment there or here. If you comment here ALSO, I will only enter you in the drawing once. I know you don’t like to hurt your chances of winning, but if you could post about this on your OWN blog, I’ll enter your name another FIVE times, just leave me a link to your blog. I’ll have the boys help me draw a name on FRIDAY, February 6th, around 4PM CST. Due to the downtime issues my blog has experienced this week, I’m extending the deadline until MONDAY, February 9th, around 4PM CST. But that’s it. I really will do the drawing that day. You won’t hurt my feelings if you don’t keep the quilt. Maybe you have a granddaughter that needs a quilt, or maybe you’d like to pass it on to a worthy charity. Maybe you are a beginning machine quilter that would be interested in having this for some ideas and reference. Lovely quilt and great inspiration for someone who has your book. No blog, but thanks for the chance to win this. I wouldn’t even mind finishing the binding. That is a beautiful quilt and I’d love to have it. Even though I quilt, there is not a single bed in our home that HAS a homemade quilt…I am nearly ashamed to admit. So…it would be terrific for me to win this…it really would! I found you from Barb at Bejeweled Quilt’s blog, in case you are keeping track. Looks old fashioned, warm & cozy — I would cherish it as the work of art that it is…made w/ love. I would love to win…I am in awe of your machine quilting!! As a newish longarmer, I would love to break free from the panto’s and take hold of the front of my machine with your kind of confidence and creativity. That’s a lovely quilt. It wouldn’t fit in to my weird decor, thus I don’t wish to enter. However, I’ve gotten great pleasure from seeing it. I would love to win!!! My nana is 88 years old and is always cold. The quilt looks cozy and It would fit perfectly on her bed. Your quilting is amazing! I can only dream of one day being able to do that! Do you have a secret that makes it easier?? LOL Great job! Thank you for hosting a giveaway! Good luck everyone! Thank you for having a blog giveaway! Love the quilt, and I am really enjoying your blog. Your camera takes great pictures! I would love to win your quilt! I wish I had a blog now just so I would have a better chance! But it only takes one entry to win,VBG! Thank you Suzanne for all you do and give. Thank you for all you do on MQR. I love going there each day to see what’s going on & to learn new techniques. You’re the best. Hi Suzanne, I hope I’m not too late. I love your blog. Thank you for all the inspirations. That is gorgeous! Hearts are my big-time favorite, and I must have made a hundred tiny hearty-arty quilts in the last ten years. I would be so excited to be allowed in the drawing too! Thank you for your generosity of heart!! I would love to win! It is beautiful and I can’t believe that you hand quilted it. Thank you for being so generous! I just found your link and am enjoying reading your posts. I would love to win this drawing…thanks for entering my name in it.